The Cougars will be conducting A/B Travel Team Tryouts for the upcoming 2019-2020 Season, for all divisions, the weekend of August 9 - August 11. All Tryouts will be held at Vallco. The Tryouts information, including the schedule for all divisions, will be posted as soon as it becomes available. 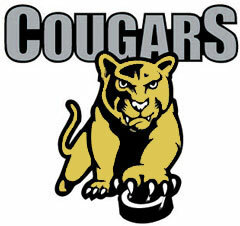 The Team Rosters for the Cougars Spring Elite League Teams, for the 12U, 14U, and 16U Teams are posted. S3 Clinics A series of individual skill-based sessions. Hyper-focus on various elements of the game. Each age group gets three, one-hour sessions per week. High Intensity Training A more intense version of S3 type training. Pre-tryout Ready for next season's tryouts? You will be much more prepared after this program. Cougar Spring League/Tournament Teams Mite through midget A/B teams that will participate in local jamborees and games (no practices) concluding with a Memorial Day tournament (most likely Valencia). Team Selections on 4/2-4/3. GSE Elite League South Teams PW through midget tier level teams that will participate in 4-6 local games and 4-5 additional practices. Tryouts on 3/23. GSE Tier Tournament Teams PW through midget tier level teams selected from Elite League participants to participate at a Memorial Day tournament (LA Area). High School Skate Skills and scrimmage format for players currently in high school or entering high school Fall of 2019. COST/PRICING Make sure to checkout significant discount options when purchasing multiple programs. The popular S3 Clinics Program at Vallco is returning this spring. First Session starts on 4/15. Please visit the S3 Clinics Program Page for more information, and to register. You register for a session by selecting its payment button. The classification of the Cougars Travel Teams is complete. Please make sure to visit the teams' home pages for ongoing updates and announcements. Schedules will get updated as new information becomes available. Please note that Vallco, like all NORCAL clubs, uses the computer-based Electronic Scoreboard for all games. The touch-screen computer remains at the rink at all times, and is hooked up to the scoreboard right before the game. It is quite easy to use, and we encourage all parents to learn the system. For your convenience, we are posting a youtube video with detailed instructions on how to use the system. Interested in getting additional information or registering for the program? Visit www.escrip.com. We're Friends of the Cougars (id #5289256), and we'd love your support! Having trouble with our menus? Try using our Site Map for the web site. Contact the webmaster to correct anything or to have something posted.